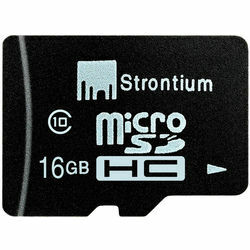 If you need a thunder-speed data transfer, the more you should try out Strontium MicroSD card Class 10 that would show you the real power of speed. With an improvement of transfer speed of 10Mb/s, you will be amazed that the data transfer is complete with a blink of your eyes. It can store higher definition of videos, higher resolution of photos and you dont have to worry about losing your precious data. Are the irritating pop up of 'Memory Full' troubling you? Not anymore ! Buy memory cards online that come with the ample storage capacity, starting from 4GB, 8GB to 64GB and more. If you need a thunder-speed data transfer, the more you should try out Strontium MicroSD card Class 10 that would show you the real power of speed. With an improvement of transfer speed of 10Mb/s, you will be amazed that the data transfer is complete with a blink of your eyes. It can store higher definition of videos, higher resolution of photos and you dont have to worry about losing your precious data. Supports SD system specification version 2.0 Supports SD SPI mode Card Capacity of Non-secure Area, Secure Area Supports Specifications Convertible to full SD card size with an adapter (optional) Class speed 10 Guarantees minimum data transmission of 10MB/s Default mode : Variable clock rate 0-25MHz, up to 6MB/sec interface speed High-Speed mode : Variable clock rate 0-50MHz, up to 10MB/sec interface speed Complies with highest security of SDMI standard +4KV/-4KV ESD protection in contact pads Are the irritating pop up of 'Memory Full' troubling you? Not anymore ! Buy memory cards online that come with the ample storage capacity, starting from 4GB, 8GB to 64GB and more. Maximum retail price of the product is subject to change without prior notice. Actual color and dimension may slightly differ from the screen image. Specifications (with respect to the data transfer rate) are subject to change without prior notice.